The reVision FC players, most of whom came as refugees from a mix of African countries, huddle on a Houston soccer field before a big game. 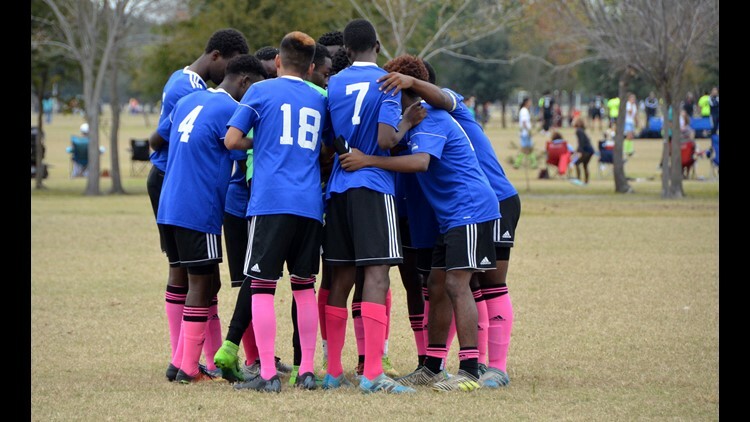 HOUSTON – The boys in royal blue huddled in the middle of a soccer field, arms locked, heads bowed, their lucky hot pink socks a sharp contrast to the browning grass and storm-threatening sky striated with slate and gray. In few minutes, the reVision Football Club would play their final match of the fall season. If they won, they would qualify for a state soccer cup for the first time by beating last year’s champions. They would defy the odds – as they have been doing all their lives. Most of the teenage players were born in refugee camps in Africa and arrived in this country with nothing, save a few phrases in English – “Hello” “How are you?” “Where is the food?” – and the yearning for a better life. Here, they encountered a different kind of struggle: New languages and unfamiliar cultures, classrooms where they are bullied for their accent and skin color, hardscrabble apartment complexes where street gangs fish for fresh recruits – and now, a president who has made it clear that refugees are no longer welcome. But one thing has remained constant. From Africa to America, they have found ways to keep playing soccer. In the beautiful game, they discovered strength and self-confidence. In this team, which came together almost by accident, they forged a brotherhood. In their stories, they offer a glimpse into the challenges confronted by refugee children – who, in 2016, made up about 44 percent of those resettled in this country. 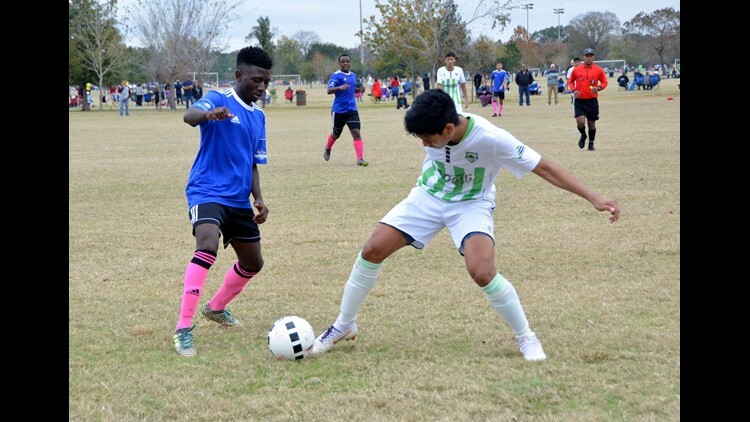 Now, on the Sunday before Thanksgiving, the reVision FC squad gathered in a scrum on Field 26 in Bear Creek Pioneers Park in northwest Houston, ready to face Cedar Stars Academy-Green. No matter what happens, team captain Francois Elize, an 18-year-old born in Congo, told the others, we will not hang our heads down. Iluta Shabani, who came to this country three years ago and dreams of playing pro soccer, heard about the games from a friend passing by on a bicycle. Every Sunday, he told Iluta, a group of boys converge to play pick-up soccer on a grassy expanse behind St. Luke’s United Methodist Church Gethsemane, a church in the heart of the city's refugee enclaves. Iluta grew up in the vast Nyarugusu refugee camp in Tanzania where he used plastic bottles and wadded bags as makeshift balls. The 17-year-old followed his friend to the church campus – running behind him for more than 2 miles. Erick Musambya found out about the St. Luke's field from a cousin. At first, he was afraid to go – his parents, who are from Congo and feared that America was like the violent, gun-toting images they had seen in movies, kept their children safely inside. But soon, he became a regular. So did Amani Godfrey, who left Tanzania when he was 3. In Houston, where he was raised, he had always played soccer with his family. Now, he began to use the impromptu games as a way to distance himself from a crew that did little but hang out and smoke. Iluta Shabani, 17, a reVision FC player, came to the U.S. from a refugee camp in Tanzania three years ago. These were the kids Charles Rotramel, who runs reVision, a nonprofit that works with youth involved in the juvenile justice system, had hoped to draw when he turned the swatch of grass behind St. Luke’s into a soccer pitch. Most were refugees from Africa, with lives that had been filled with chaos and trauma, with stories of parents who escaped civil strife in their homelands and fathers killed in unrest. They didn’t quite fit in with Spanish-speaking Latino classmates or English-speaking African-American peers. Their parents worked long hours for meager wages, leaving them alone for stretches of time. They were looking for a place to belong – making them ripe targets for gangs like the Southwest Cholos and MS-13 that plague the southwest Houston neighborhood. In that part of town, apartments once marketed as singles’ complexes now house families resettled from Africa, Asia, the Middle East and Latin America. The marquee sign outside St. Luke’s greets visitors in English, Spanish, Swahili and French – a nod to the community and to the diversity of Houston, home to one of the largest refugee populations in the country. At nearby Margaret Long Wisdom High School, refugee students hail from 29 different countries, including 13 African nations. They often arrive far behind grade level and able to speak two or three languages, but not English. Soccer, Rotramel thought, could be a way to keep these kids from getting entangled in street life. He quickly realized how good the ragtag bunch of players were. How they delighted in the touch of the ball. How the boys, who barely knew each other, seemed to move in harmony. It was a team waiting to be formed. That, two years ago, was the start of reVision FC – and the birth of something bigger than soccer. 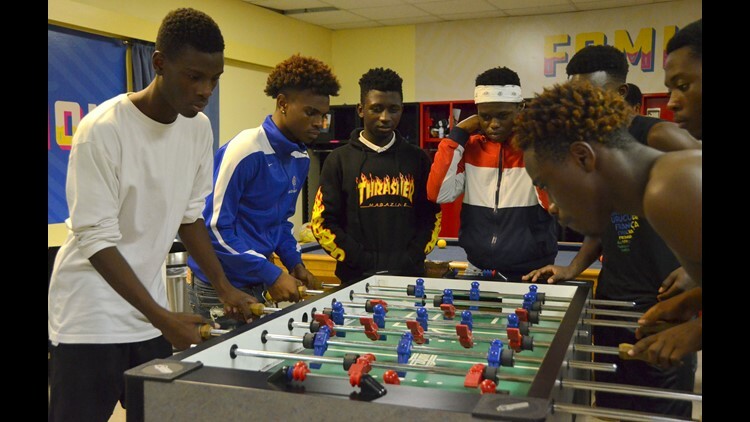 With more than a week to go before the match against Cedar Stars Academy-Green, the game room inside the reVision offices was brimming with tumult – noise and laughter, the clatter of pool balls and the clacking of a foosball game, snatches of singing and snippets of Swahili. As it always is on practice nights. 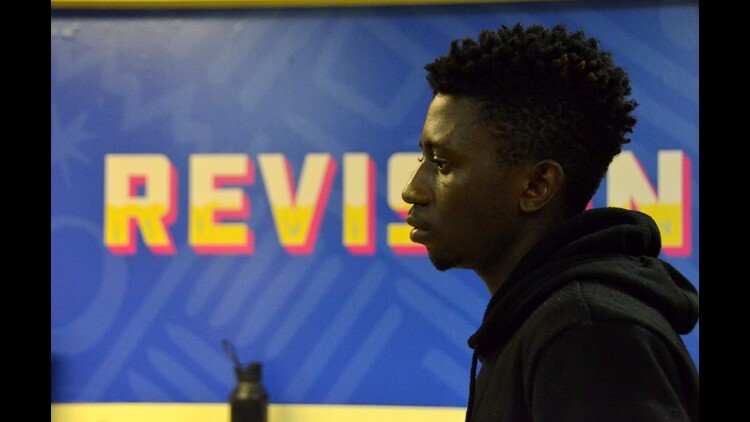 The reVision FC game room is a second home for the players, who say they have become a family. Amani, Iluta and Erick crowded around the foosball table, taking turns as a teammate rolled past one challenger after another. Another group played a soccer video game on a flat-screen TV affixed to the wall, next to a framed poster of Marvel’s “Black Panther,” a movie set in the fictional African country of Wakanda. Above a row of red and black lockers, a single word was painted high on the wall: Familia. That is what this team has become. When some players were forced out of their homes during Hurricane Harvey, Rotramel and reVision provided supplies and shopping trips; their teammates helped with moving and moral support. When Erick’s mother moved to Kansas City last year without warning and Amani’s family relocated to a neighborhood on the northside of Houston, Iluta’s family took in both of the teenagers. When Rotramel breaks out snacks and food for the players, who often don’t have enough to eat at home, many secretly pocket the offerings – to take home for younger siblings. Michael Chavez, 17, takes a photo of fellow reVision FC player Amani "Fufu" Kwizera, 17, to post on Instagram. In this space, with each other, they reminisce about what they left behind – playing soccer in bare feet, hunting birds with slingshots, the friends still in refugee camps. They incorporate African music and choreography into weekly hip-hop dance sessions. They teach Swahili to the three Latino players and absorb some Spanish in return. It was here that Iluta, who has had to be the man of his family – looking after younger siblings, helping his mother, who uses a wheelchair, with errands and household chores, serving as translator – found a support system of his own. A few months back, after his mother, a single parent of five left severely disabled during the civil war in Congo, fell short of rent money, reVision stepped in to cover the costs. In middle school, just after he arrived in the U.S., Iluta's classmates mocked him because he couldn't speak English. Now, the 11th-grader not only knows the language, he is often the first in his Wisdom High School classroom to answer questions from the teacher – and he no longer feels alone. It was here that Amani soaked in stories about refugee camps in Tanzania, the country he can’t remember. Here that the teenager learned Swahili (at home, his mother speaks Kirundi, the language of her native Burundi). It is here where they talk about a political climate increasingly hostile to refugees. Only 22,491 refugees were admitted in the last fiscal year – the second-lowest level on record. This year, the U.S. State Department plans to cap refugee admissions at 30,000, less than a third of the number resettled in the last year of the Obama presidency. In the 40 years prior to the Trump administration, admissions averaged 96,000 a year. They worry that the drastic cuts will make it nearly impossible for family members still in Africa – like Iluta’s grandparents – to join those already here. 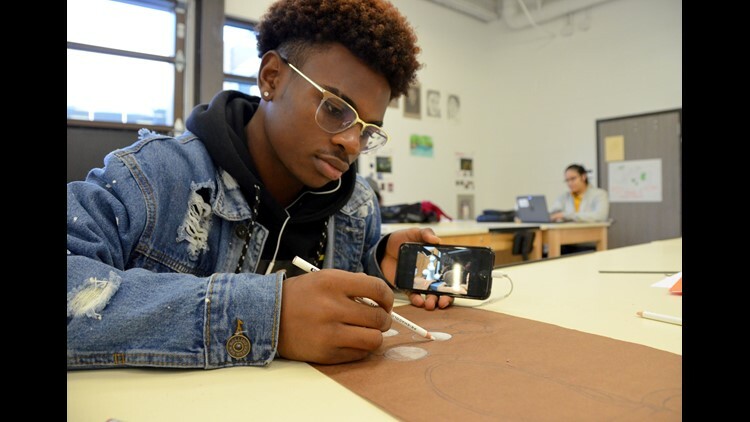 Amani Godfrey, 18, a reVision FC player, works on a drawing at Houston's Margaret Long Wisdom High School, where refugee students come from 29 different countries. They worry that resettlement agencies that help refugees with things such as job training, English classes, citizenship applications and counseling for trauma will be closed or cut back as the admission numbers drop and funding dries up. Dozens around the country have already been shuttered or streamlined. Then there’s the rhetoric – from the president, on social media, in passing interactions – that paints refugees as safety threats or drains on the system (despite numerous studies showing the contrary). Erick, 18, who arrived the U.S. five years ago knowing no English, knows what it is like to be judged by his accent and appearance. He also knows how to plow ahead – an example of the resilience and drive many refugees bring with them, said Wagma Isaqzoy, who works with refugee students at Wisdom High School, where many emerge at the top of their class just a few years after arriving in this country. After fleeing Congo for Tanzania, Erick’s family spent 10 years in the Tongogara refugee camp in Zimbabwe, where he had to steal food and eat wild birds to survive. Last winter, he came home after soccer practice to find the apartment empty. His mother, looking for work, had moved with his siblings to Kansas City, Missouri. 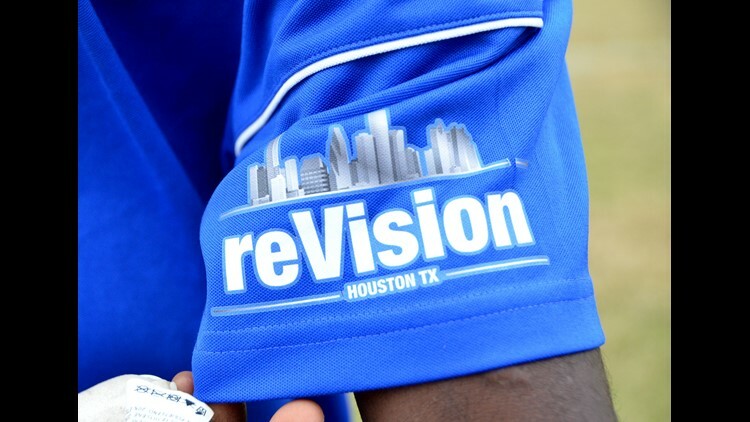 A player on reVision FC, a Houston soccer team made up mostly of teens who came to the U.S. as refugees, shows off the club symbol. Rotramel offered encouragement. Iluta offered a place to stay. Soccer offered a purpose. The Monday before the big game, he graduated from a six-week certified nursing assistant course run by St. Luke’s and Wesley Community Center. As soon as reVision took the field against Cedar Stars, they were pushing to the goal. In the 18th minute, a kick by reVision’s #9 – 18-year-old Antoine Kamengele, who is from Congo – that seemed to be off the mark was somehow deflected and ambled into the net. Goal! ReVision FC, 1. Cedar Stars-Green, 0. The other team, now flustered, earned fouls and yellow warnings cards. The reVision players continued to press, communicating in their own patois, a mix of English, Spanish and Swahili. 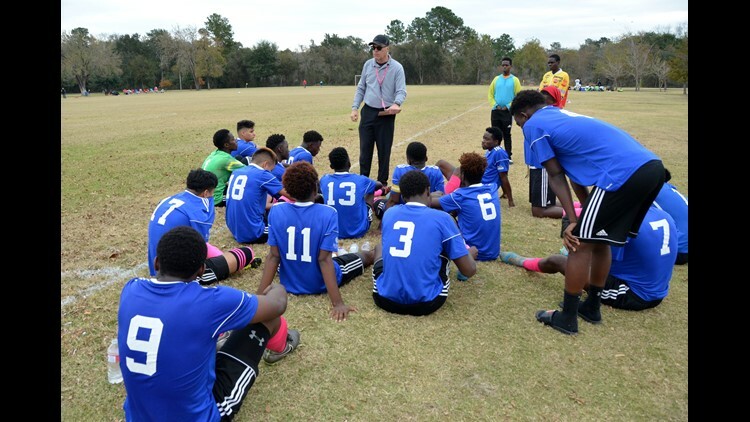 Coach Charles Rotramel gives his reVision FC players a pep talk during half-time of a big game in Houston. At halftime, with the score still standing at 1-0, Rotramel rallied his team. If reVision could keep up the pressure, the game could be theirs. As storm clouds rolled in and rain droplets began to fall, the second half brought more yellow cards for Cedar Stars players. More jeers directed at reVision from Cedar Stars fans. The referee warned that team's coach: If the behavior didn’t stop, he would call the game. Rotramel was on his feet, pacing back and forth along the sideline. Iluta Shabani, 17, a reVision FC player, tussles for the ball with a player from the Cedar Stars Academy-Green team. With 15 minutes left to play, a confrontation nearly erupted. The Cedar Stars side had lobbed insults at Iluta, who had to be held back by his teammates. “Iluta, don’t let them get in your head,” Amani cautioned. Iluta sat on the bench. The clock ticked toward the closing whistle. Rotramel paced faster. They didn’t. Final score: 1-0. A victory for reVision. Smiles spread across the faces of the reVision players. Iluta jumped high in the air. Umoja ni nguvu. Unity is strength.